Explore seven beautiful valley vineyards on this wine trip. Oregon Wine Country is known for producing some of the finest wines in the world. But not only do our vineyards grow great grapes—they also create some stunning views. Sarver Winery: Specializing in small-lot production of fine Willamette Valley wines, from a vineyard with unsurpassed views out over the valley. Tyee Winery: Tyee makes certified organic wines with a vineyard located on a century-old family farm, surrounded by heritage fruit trees and criss-crossed with nature trails. 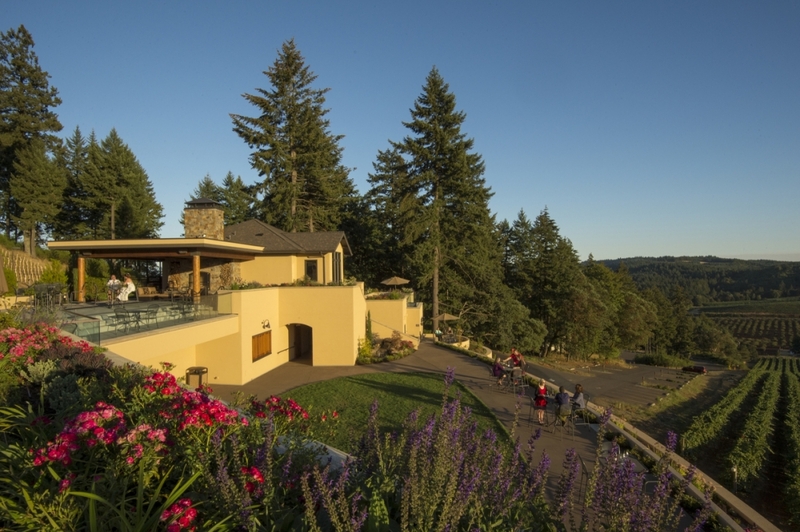 Marks Ridge Winery: Marks Ridge is the highest-elevation winery in the Willamette Valley. Enjoy panoramic views from this boutique producer tucked into the foothills of the Cascades. Willamette Valley Vineyards: The newly-remodeled tasting room at Willamette Valley Vineyards offers delicious food pairings to go along with the sweeping views and fine wines. Cherry Hill Winery: In the Eola-Amity Hills west of Salem, Cherry Hill produces premium Pinot Noir on a beautiful 150-acre estate with a vineyard, cherry orchard, and small lake. Winter’s Hill Vineyard: Winter’s Hill sits in the storied Dundee Hills of Oregon and is a stop on the Willamette Valley Birding Trail. St. Josef's Winery: St. Josef's is a large European old world styled winery and one of the first 25 in Oregon. Take in the unique architecture while enjoying one of their many varietals.